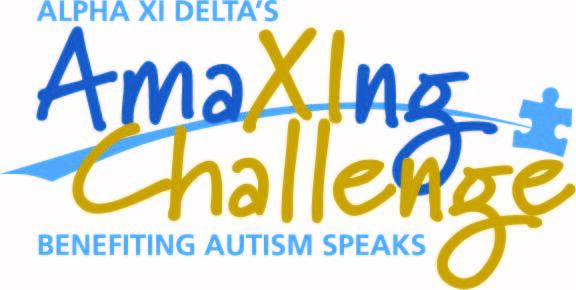 The AmaXIng Challenge is Alpha Xi Delta’s signature fundraising event designed to raise funds and awareness for Autism Speaks. The Zeta chapter has many events to help Autism Speaks. In the Fall of 2016, we hosted Xiti with the Xi's, a Xiti based food event that serves to fundraise and increase awareness of Autism Speaks on our campus. In the Fall of 2017, we hosted Pizza Palooza, a late night pizza event which allowed us as a chapter to share information about autism. This coming Fall of 2018, we will be hosting Mac & Cheese with the Xi's. Finally, in the Spring, we host Xi Man a talent competition where men, generally representing fraternities, athletic teams and student organizations, compete for the title of Xi Man. Activities can include penny wars, an autism trivia competition, a community-wide children’s carnival and a pageant, just to name a few. Below is photo of some sister with the 2017 winner.